Puck Pentenga dispossess an opposing player. The senior midfielder had one assist this weekend. After a crushing loss to Ohio State last week, Northwestern knew the importance of this weekend. A two-game set against ranked Big Ten opponents No. 14 Rutgers and No. 6 Penn State promised to be crucial for an at large NCAA tournament bid. But the Wildcats could not make it work at Lakeside Field against the Scarlet Knights (11-4, 3-4, Big Ten), despite doubling Rutgers in shots (8-4), and penalty corners (6-3). The Scarlet Knights jumped out to an early two-score lead, with goals from midfielders Linde Van Schaik and Daphne Groothuis in the eighth and 20th minutes, respectively. But the NU (8-8, 3-4) offense fired on all cylinders, with balls flying everywhere except into the net until senior midfielder Eva Van Agt answered the clarion call in the game’s 23rd minute to cut the deficit in half. Van Agt dribbled past three players into the circle, and her rip beat Rutgers goalkeeper Gianna Glatz for her fourth goal of the season. The Cats searched the rest of the game in vain to find an equalizer, forcing three saves out of Glatz, but the team could not find an answer to the stout goalkeeping from the other side. Senior midfielder Puck Pentenga paced NU with three shots and one on goal, followed closely by Van Agt’s two shots which were both on target. Coach Tracey Fuchs said the Cats found a way to respond after going down early, but their firepower wasn’t enough. On Sunday, NU came out flying against the Nittany Lions (9-4, 4-2), controlling the game’s first ten minutes and firing two shots at Penn State goalkeeper Jenny Rizzo. Junior forward Saar de Breij capitalized on the early success, scoring her fourth of the season to put the Cats ahead in the fourth minute. The lead did not last. The Nittany Lions scored the game’s next four goals, all coming from scrums directly in front of the net. The Nittany Lions ended the first half with 11 shots to NU’s mere three, with three penalty corners to the Cats’ zero. Fuchs said NU needs to clean up its handling of defensive rebounds to be more effective in keeping the ball out of their own net. The Wildcats came out of the halftime break with renewed energy, and freshman forward Maren Seidel’s sixth goal of the season cut the deficit to two. Seidel deflected Pentenga’s penalty corner shot at the front of the net to give NU new life in the game. And the offense kept coming, with sophomore midfielder Mackenzie Keegan deflecting home her second of the season off a pass from senior midfielder Charlotte Vaziri from the penalty corner spot with 13 minutes left to play. 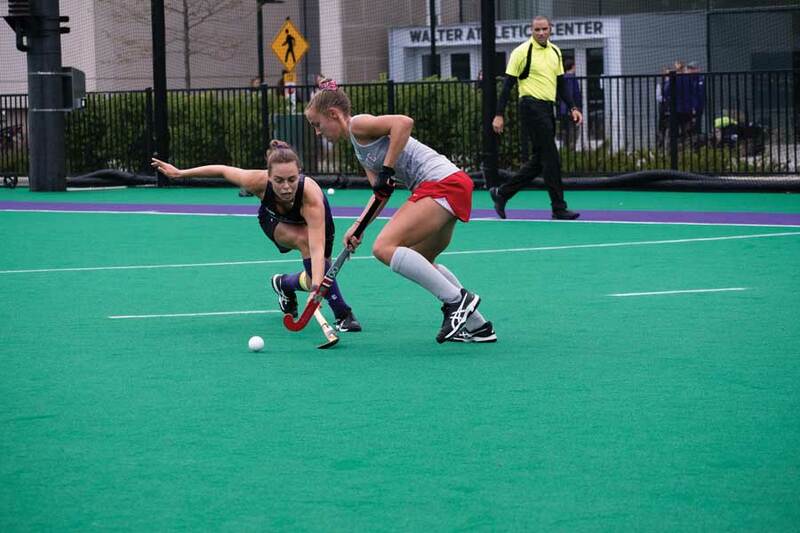 But, like against the Scarlet Knights, the Cats were unable to find a game-tying goal. The loss was NU’s third one-goal defeat in a row. But de Breij said she feels NU — which has lost four of its last five — is closer than ever to finding the formula for winning consistently.